Start reading The Book on the Taboo Against Knowing Who You Are on your Kindle in under a minute. ck on the illusion that the self is a separate ego that confronts a universe of alien physical objects. 4.0 out of 5 starsConfusing but inspirational. Alan Watts has a unique way of explaining the unexplainable, this book contains some mind stretching but thought provoking ideas. Our differences point to our one-ness, outside and inside are the same (just look at a Klein bottle), you can't have up without down so they must be one. This book, like many others will make you think beyond your current thoughts and if you're lucky you might stop (but why would you want to?). A wonderful book. Well worth the read. Watts puts a unique spin on concepts that have been discussed by religion and philosophy for eons. Highly recommend. An amazing author buying all his books for sure! This will surely be a eye opener to those willing to dive in. 5.0 out of 5 starsOne of my favourite philosophers. It's quite funny how we try to voice our opinion about everything and anything. This book tells us not to. Theses opinions, thoughts join the ocean of energy which is life. I listen to Allan on YouTube quite often. It's afore of meditation for me. So was this book. 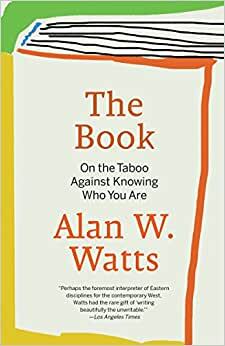 Although I'd first heard of Alan Watts' The Book: On the Taboo Against Knowing Who You Are several years ago, it wasn't until I watched Dakota Wint's YouTube video Top 5 Books Every New Spiritual Seeker Needs that I was motivated enough to actually check it out. First things first—I know that I will benefit a lot from re-reading this book several times. It's extremely dense and packed with a lot of valuable information, a lot of which I likely didn't absorb during my first reading of the book. The concept of "I" is extremely powerful and commonplace in most societies on Earth, and it is so fundamental to our modes of speech and thought, as well as our laws and social institutions. Watts spends many words of this book arguing against the concept of personal selfhood in favor of a more universal concept of identity—one that includes the rest of reality in addition to the components that we would normally judge as "ourselves". One of the other things I found interesting was Watts' definition of "attention" as "narrowed perception"—because when we attend to one thing, we ignore everything else. In Watts' own words: "conscious attention is at the same time ignore-ance (i.e., ignorance) despite the fact that it gives us a vividly clear picture of whatever we choose to notice." These are just some of the concepts that Watts describes in The Book. If either of these ideas sound interesting to you, I would definitely give this a read. I wish that this review was able to more fully show how wonderful this book is, but since this is only my first read-through, I feel like I was only able to skim the surface of its ideas and therefore will likely have more to say about it upon successive readings. I definitely give this one two thumbs up though! This simple book has been one of my Bibles for over 50 years. It conveys the essence of Watts' thought and insight which provides a fundamental philosophic grounding wholly compatible with both modern science as well as a spiritual dimension. Though said to be the first to introduce the West to Eastern religion, he really breaks rigid boundaries of religion, inviting the reader to discover a Natural Theology that makes the Universe our home. I bought this book because I have been very interested in mediation and the true nature of consciousness since reading "Waking Up" by Sam Harris. I will start with a brief caution to the prospective reader. If you, like me, consider yourself an epistemological realist, you might recoil from some of the language and ideas presented in this book. Initially, some of them seem like what many people would call "whew whew" or "hippie mumbo-jumbo." I think it is important to understand that this language is to be expected when attempting to describe the construals of subjective experience. If you have read Eckhart Tolle, I think you will be familiar with what I am talking about. All this being said, what a fantastic book! Watts has a masterful way of using analogies to express relationships that might otherwise go undefined. I especially like his analogy of falling from a cliff, and how it maps on to how we should live. He gave me a lot of valuable insight as to what the Self is. Most importantly, he showed me how in our seeking to relinquish the Self's control, we often reinforce it. The way he walks you through it all in the second to last chapter was masterfully crafted. It felt like what I imagine the "pointing-out instruction" of Dzogchen feels like. For every brief insight or moment of wisdom Alan Watts imparts, he makes you pay for it with pages of blather. My word but this man likes to drone on. He frequently repeats what he must think are clever phrases (within one book and over several books) until you are sick of reading them again and again. He ruins whatever deep thought he's trying to convey by piling insipid words on top of each other. Here's a phrase he must have never heard: less is more. And with the sudden tinkling of the unseen bell I put the book down and did not pick it up again. Just so much smug western white male self love from this ivory tower icon. There is, to be fair, a good deal of insight in his collective writings, but there is far more cumbersome rubbish one must slog through to find it. So much of this is obsolete or moribund that it chokes whatever wisdom may be lurking within. At some point I thought I would read everything and copy out the passages that resonated with me and put together a little book of my own favorite sayings of Alan Watts, but then I thought of all the other books I would be missing out on in the process.